Every year in the Smoky Mountains, the famous colors of Fall foliage give way to the magical time of winter. The pumpkins of harvest festival and Halloween are put away against the cold and the beginning snows. And sometime in November, we have to admit it’s winter. But in the three neighboring towns of Gatlinburg, Pigeon Forge and Sevierville, winter comes in with a flourish. The three towns collaborate to schedule their festival openings over 3 days, and turn the night time into a blaze of millions of Christmas lights. Sevierville leads the lighting countdown on Monday, November 10, 2014, turning on literally millions of lights in dazzling displays and Christmas scenes. Live music and street dancing, hayrides and a Christmas Parade are all part of the Winterfest celebrations. Not content with lighting up the town, Sevierville also runs a great display of lights south along the highway from Interstate 40, to welcome visitors as they drive into the area. The following day, on November 11, Pigeon Forge holds its Salute to Veterans Parade, which leads into its 25th Annual Winterfest Kick-off celebration. Patriot Park is a great place to get a view as the city flips the switch on over 5 million lights. 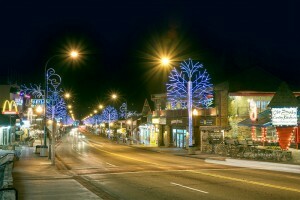 Music, food, shopping deals and entertainment rocks the evening as the town bursts alive in a festival of light displays. Gatlinburg follows suit the next day, Wednesday, November 12, as it closes Parkway and opens it up to thousands of people gathered to sample the Chili Cookoff that starts the Winter Magic tradition. The city lights go on to kick off the season, and Gatlinburg’s newly enhanced LED lights bring a crisp, high definition to the animated displays and holiday themes throughout the town. In Pigeon Forge and Gatlinburg, the famous Trolley systems offer a free Ride of Lights during each city’s kickoff evening. Nothing better than riding in a warm trolley past the best of the lights with an experienced guide unwrapping the tales and mysteries of the local places. The razzle dazzle is far from over when the three towns light up. There’s Dollywood too, with its 4 million lights and fabulous entertainments, including the Parade of Lights every day. This year Dollywood opened its Smoky Mountain Christmas Festival on November 8. Dollywood shows a world of color and a village of lights, along with its incredible Carol of the Trees, an entire area with animated displays set to Christmas music. Fall in the Smoky Mountains may be unforgettable, but as you can see, Winter is unmistakable!